We brought our dog, Benson, to Poland with us, and a friend recently asked for advice about airline travel with a dog, so I thought I’d share our experience. Our dog is a Bichon Frise; he only weighs 11 pounds or 5 kilos. Because of his small size, he was able to travel in the cabin with me as one of my carry-on luggage pieces. I bought a soft-sided carrier for him at PetsMart. I was very surprised that this little dog required the large size carrier. I guess he’s kind of leggy. The large size was still able to fit under the seat in front of me on all of planes on which I traveled. Benson’s first flight was only two hours on a Southwest Airlines domestic flight. They required no health certificate. I did make a reservation for him when I bought my ticket and paid a fee for him when we checked in. This was a good test run – a chance to check out the difficulties such as carrying a naked dog, no collar, no leash, through the metal detector. I guess the difficult part was getting him back into his collar, while collecting all of my belongings. In the back of my mind, I could picture him getting loose and taking off to explore the airport, and in this nightmare, important things like my purse and computer are missing when I return to security after chasing him down. Fortunately, my fears have not come true. Our vet in Tucson had prescribed Acepromazine, an animal tranquilizer, to keep Benson calm while in his carrier. (He hasn’t been crated since he was two, and that was eight years ago.) It worked well on our short flight. I was afraid that it would totally knock him out, but he was just very relaxed and didn’t care that he was cooped up. He snoozed a lot, but if his carrier changed position, or there were noises, he would rouse and look at us, but he wasn’t concerned about anything. Benson’s big flight was traveling from Florida to Poland. I had done some research online and knew that he needed a health certificate which could be issued by a veterinarian. Easy-peasy. Or so I thought. Benson had been staying in Boca Raton with our youngest daughter until winter was over in Poland. It made perfect sense because I was returning to the U.S. in May for her graduation. My brother has a home in a nearby town and I asked him to recommend a vet to issue the health certificate. His vet recommended a wonderful office in Boca and warned him that the process could take some time. I scheduled an appointment at Calusa Veterinary Center. Thankfully, they were able to get us in right away and walk me thorough the health certificate process. While they did complete the health certificate, it had to be approved by the United States Department of Agriculture (USDA). The Calusa staff helped me schedule an appointment the following day with the USDA in Miami. Calusa had filled the form out perfectly, and I had USDA approval in no time. If there had been an error or omission on the form, I would have to start over, and I just didn’t have time for that! The vet we saw at Calusa was concerned about giving Benson the tranquilizer and wondered if he might be alright with just anti-anxiety medication. I made a case for the tranquilizer because our travel time was almost 24 hours. We agreed that I would not re-dose the tranquilizer until it had been 12 hours, and she gave me Alprazolam which I could give in between tranquilizer doses if needed to keep him calm. Benson and I traveled from Florida to Chicago. We carefully planned our trip to be sure all layovers would allow me enough time to exit the secure area and take him outside at every airport. In Chicago, we were to board a LOT Polish Airlines flight to Warsaw. The ticket agents carefully scrutinized Benson’s documents. After about 20 minutes and involving supervisors, he was cleared to board the plane. This was in stark contrast to my experience when we landed in Warsaw. I asked the immigration agent who stamped my passport if she needed to see his documents, and she said no, so we went on the baggage claim. If there is a government authority that should have reviewed his documents, I don’t know who it was. Benson arrived in Poland, a little groggy, but otherwise in great shape. I should also add that, by law, airlines can only carry two animals in the cabin per flight. Make sure to reserve a spot for your animal when you purchase your ticket. I had to get his chip number for the airline before I could reserve a spot for him and in the interim, the cabin had filled its pet allotment. I had to rebook my flight, slipping my travel a day. We’re beginning to think about our visit to the States for Christmas, and I’m convinced that it’s time to start working on Benson’s documents for the flight going the other way. I’ll let you know how it goes. 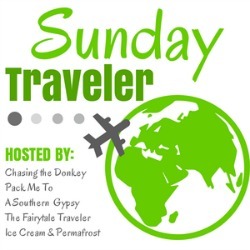 For more travel tips check out the Sunday Traveler posts on Chasing the Donkey. What an adventure Benson has had. I didn't think about having to take their collar and leash off. Downright scary! Anonymous – hahahah. The comment above is from my sister who has greyhounds. Informative post! I travel a lot with my dog but I have not ventured into air travel with him. He’s a large dog so I would have to check him – which is part of what deters me. Thanks, Brittany! It is scarier to check your dog, but I have a friend who travels between Washington DC and Paris every summer with her German Shepard, and they haven’t had any trouble! She said the crew goes down below to check on the animals during the flight. What a journey for your 4 legged friend. At least he is small enough to fit under the seat. I wouldn’t want to check an animal. Flying is terrifying enough and without someone nearby it must be traumatizing! He is quite the traveler, and still more this year! We did 4000 Km in the car this summer with him, and have short flights planned to Amsterdam and Rome with him.